Sedang sibuk mencari hotel buat liburan kamu. Mau cari yang murah dan ada promonya juga. Jangan khawatir kamu bisa melakukan pemesanan hotel di orbitz.com. Selain memiliki database hotel yang terbilang lengkap banyak promonya juga. Dengan pemesanan hotel di orbitz.com kamu bisa mendapatkan diskon hotel 15%. Caranya lakukan pencarian hotel dengan memasukkan promo code GIFTME di form pencarian. Dan harga hotel langsung didiskon 15%. Mau melakukan pemesanan sekarang, baca dulu detail promo hotel orbitz ini. The gift that keeps on giving! Take 15% off your hotel stay with promotion code GIFTME. Hurry, this deal is only valid through January 4, 2015! Don’t forget you can double up on discounts, combine your coupon code with a special hotel offer, such as free nights, room or suite upgrade, or dining and spa credits. Treat yourself to the vacation you deserve. Book by 11:59 PM CST on January 4, 2015 for travel by June 30, 2015. See terms below. Book a qualifying hotel between December 2, 2014 12:01AM CST and January 4, 2015 11:59PM CST, for 1 or more nights for travel between December 2, 2014 and June 30, 2015, via Orbitz and instantly receive 15% off through the use of the promotion code. Limit one discount per hotel room and one promotion code per booking. Discount may not be used toward the booking of a vacation package. Discounts are not redeemable for cash for any reason. Promotion codes are non-transferable, not for resale, and cannot be combined with other offers. Any attempt at fraud will be prosecuted to the fullest extent of the law. Void where prohibited, taxed or restricted. Orbitz reserves the right to change or limit the promotion in its sole discretion. 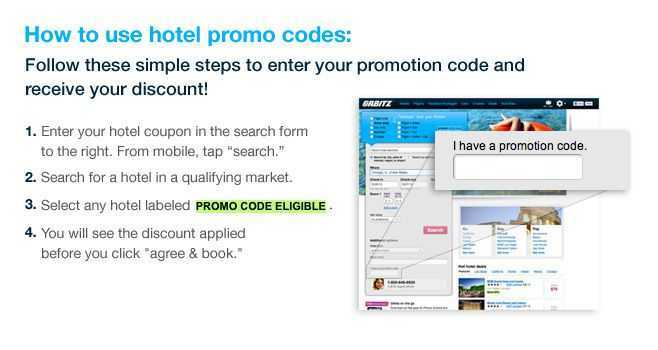 Most major chains are excluded, to find participating hotels look for the “PROMO CODE ELIGIBLE” message. Offers valid at participating hotels only and are subject to availability. Minimum night stay may be required, and varies by property. Rules, restrictions, and black out dates may apply. See property pages for further details.